Nelso Blog: Why didn't Volvo want Android users? The baseball season has started, and tempted by an offer of free access to live games for the month of April, I downloaded the MLB.com At Bat app for the iPad. The free live baseball broadcasts are sponsored by Volvo. 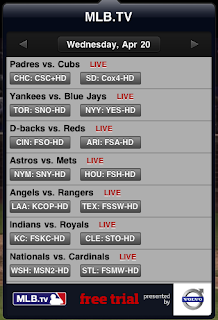 However, the promotion is only available to iOS users, even though the MLB At Bat app is available for Android. Curious. One can assume that this promotion was quite expensive (a one month subscription to mlb.tv costs $19.99), and as such Volvo had to choose its demographic target carefully. The auto industry is also using touch smartphones and tablets as a medium to reach new potential customers, given the attractiveness of the user base. Specifically, U.S. iPhone and Android users are three times more likely to buy a new car than the U.S. adult population. But it's really no surprise that Volvo wouldn't want to advertise to Android users. The Android demographic probably isn't a good fit for a Scandinavian luxury car maker. Most of the criticisms of iOS and Apple could also be applied to Volvo: the product is too expensive compared to other products with similar capabilities, the marketing stresses hard-to-define qualities like "design", "safety", and "user experience", and "I don't see myself as one of those people" (the bourgeoisie). So who should Major League Baseball get to sponsor the Android version of the app? I can think of a few possibilities. Hyundai: The most common complaint about Apple products is that they are expensive. The Hyundai Accent is the cheapest car sold in the US, and so is immune to such charges. Chevrolet: Even if one does want to spend a lot on a computer, many wouldn't buy Apple because they can get the same processing power for less. The Chevy Camaro, producing 312 HP in its base configuration and costing only $22,680, has more power per dollar than any other car. Other possibilities would be kit cars (for those who build their own computers) or the Jeep Wrangler (lots of customization possibilites). In my case, the promotion worked well. I have two small children, and after watching hundreds of Volvo ads in the MLB At Bat app, I'm seriously considering a Volvo for my next car purchase.